Is the connected fitting room the future of retail? While eCommerce is increasing year on year, footfall into brick and mortar shops is falling, as customers are seeing online as an easier and cheaper challenge to buy their goods. So what is the future of the high street? More closing down sales and boarded up shops as retailers fail to keep up with online competition? I’m not so sure; I think there will always be some kind of demand for some physical retail stores, especially in the fashion industry. For instance, this weekend was a particularly sunny weekend for us Londoners, and after a leisurely brunch, my friend and I decided to head to the park. But she had made the big mistake of wearing jeans, and with temperatures peaking at 24 degrees, she popped into a shop to buy a skirt on the way to the park. So whether you’re picking up an impulse buy £7 skirt in H&M or your spending thousands on an Oscar de la Renta ball gown, there are some occasions when visiting a shop is necessary and even pleasurable. And some retailers are lucky enough to have a steady flow of customers strolling through their doors to feel the fabric of a dress and brave the ill-lit changing rooms. But shops such as John Lewis and M&S aren’t sitting back and hoping this will continue, they’re actively looking at ways to make the in-store shopping experience better using technology. From kiosks, iBeacons, internet of things (IoT) and augmented reality (AR) mirrors, the retailers have been at the forefront of in-store technology innovation. But it’s not always paid off – John Lewis experimented with AR mirrors, and quickly dropped the project as part of its ‘fail fast at innovation’ strategy. 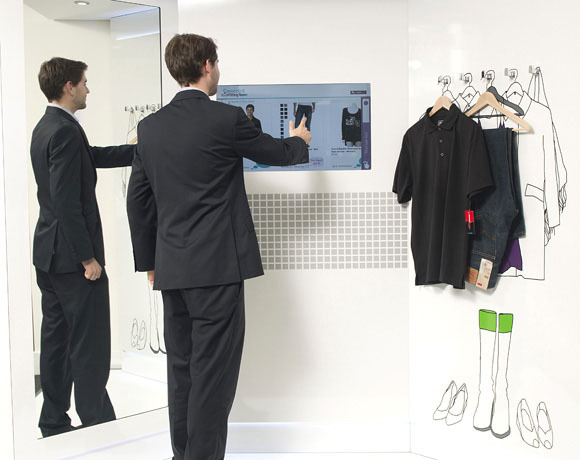 But now another technology offering for the fashion industry is on the horizon – a connected fitting room. Avanade and Accenture’s Connected Fitting Room is less gimmicky than an AR mirror and may stand a chance to make it into some of the UK’s changing rooms. Already being piloted by Kohl’s in the US, this ‘intelligent system’ uses a combination of digital, mobile, cloud and analytics to enhance the customer’s in-store experience. RFID tags allow the fitting room to identify clothes when a shopper hangs them up as they enter the fitting room. Their items then pop up on a touchscreen in the cubicle and offer a number of services. The shopper can see different sizes, styles and colours available in-store which can be requested from the touchscreen and an assistant on the shop floor will receive an alert to their smartphone. The Windows technology – which is the same tech which runs ATMs and kiosks – could also offer special offers and promotions or allow the shopper to login to their online profile and purchase the item online if it isn’t in stock. And the retailer also gains insight from this area of the customer journey. Real time metrics show retailers which items of clothing have been tried on, and perhaps send an alert if customers are tending to request an item in a larger size which could determine a bad fit. And Kohl’s seem to like it. It’s been live in a small number of US stores since January, but the retailer has just agreed to expand the pilot to other stores to understand potential ROI before committing to the technology. Now the tech just needs a retailer like John Lewis or M&S to trial it in the UK so it gets in-front of a significant amount of consumers. Will it be a ‘fast fail’ or an innovative success?